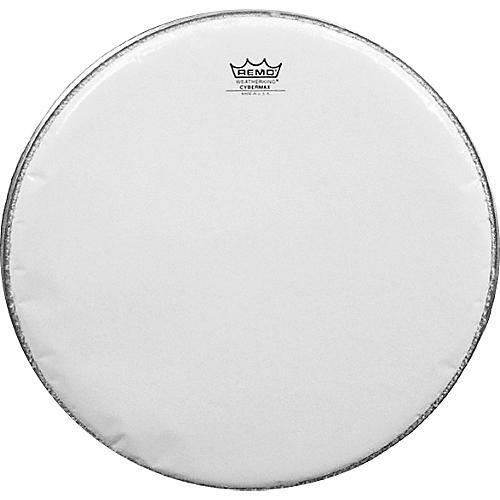 Remo CyberMax High Tension Drumheads White 14 in. Designed to perform at incredibly high tension, Remo's new CyberMax drumheads for Pipe Drums offer exceptional strength, responsiveness, precision and stability thanks to the company's unique "DuraLock" technology and state-of-the-art Aramid fiber material. CyberMax heads feel great to play and are incredibly responsive, no matter how high the tension is set. They provide superior sound distinguished by a crisp, clear attack. Because of CyberMax's extraordinary definition, the heads offer a wide range of controlled dynamic variations from the subtlest to the loudest parts. The heads are designed to perform equally well indoors or outdoors, for solo or ensemble playing. World Champion percussionist Jim Kilpatrick says, "When I am performing at the highest level of competition, I need to know that my drum head is going to give me everything I ask from it. I have competed throughout the entire year with the new CyberMax head and it has proven to be the most responsive and durable head I have ever played."